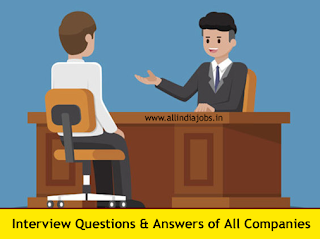 Dear job aspirants, in this page we have provided interview questions of various companies (IT, BPO, Startup and Govt companies) which you can refer while going for interviews. This will definitely help you in all the possible ways to clear the interview or at least will give an overview of what kind of questions are being asked in an interview. We have put our complete efforts to collect various interview questions asked by various companies. Let’s get into the details. To get a job in MNC Companies or Startup Companies or Government Sector you will have to face an interview. Basically, an interview is analyzed in two views i.e. The interviewer’s point of view and the interviewee’s point of view. The interviewer always expects something new from the candidate where as the candidate does not feels free to express his views clearly. This is the reason why people fail to clear an interview in their first few attempts. Let us now have a glance at them in detail. The two important things which will decide the future of a person are the education he possesses and the career he chooses. Education plays a primary role in building up the career of a person. After the completion of basic education i.e. Graduation, you will be in a confused state regarding your career. Either to possess a higher degree of education or to search a job opportunity which suits your educational qualification? Is the interview process same for each and every job? What are the questions asked by the interviewer? How should we answer them? What are the basic requirements of a person to get a job? And much more like domains of work in their company, salary details, etc,. We are here to help you in your interview process by providing the interview questions and answers (how to answer) asked by the interview. In this section, we have provided various multi national companies interview questions. In MNC’s the interview questions posed for you will be mostly used to test your technical knowledge, your problem solving and coding skills. A technical interview for a fresher is conducted mainly to check whether they can be able to work in various programming environments, understand the client’s requirement and design the product accordingly or not. For freshers, the interview process will be almost same for all the MNC companies. It comprises of a written exam, a technical round and finally HR round. In the case of experienced candidates, you will be interviewed based on your skillset or the position that you have applied for or the domain that you worked on. The interview process varies based on the position you are getting interviewed for. Start company interviews are a bit different than regular interviews. You should be able to handle almost all tasks in a startup company. So you must have a very good technical knowledge, good communication skills, and management skills. Here in these interviews, you will be checked by the way you analyze a problem and solve it. It is so because the work you do here is almost related to that. You need to talk to the customers/ clients of that particular company and then try to clear their problem in the best possible way. Key skills required for this job are quick understanding and resolving of the problem in less time. To get a job in the government sector is a bit typical. The interview process of a government job consists of a written exam and then there will be face to face (HR) interview. The complex part of the interview for a government job is the written exam. We are here to help you to clear the written exam by providing the previous papers, exam pattern, syllabus and the most commonly repeated interview questions. After the completion of the role specific interview i.e. the technical interview, each and every person will have to face another round of interview called the HR interview. This is the final round of the interview process. This plays a major role in the interview process as the candidate is analyzed and calculated completely by the interviewer by the end of this round. It is very typical round because there is nothing right or wrong answer in this round. You may also be given some situations and are asked about your decision. Each and every word you speak, the way you answer, your facial expression, your sitting posture everything counts here. In this page, we are here to provide you with the basic HR interview questions that are most commonly asked in each and every interview. Here are the tips to clear HR interview round. • Be clear with what you want to say. • Don’t give incomplete statements as answers. • Be confident and maintain your energy levels high. • Don’t be too high or too low. • Maintain constant tone throughout the interview.